Charge Doctor sends out serial data in ascii format at 9600 bauds, one sample every 10 seconds. Softwares used below to record and process data are all free and open source. N.B. Charge Doctor does not store data. A PC must be connected during the charge to log data in real time. Datalogger.exe : capture dongle’s serial data and append to log.txt. bin/KST2.exe : chart graphics from log.txt . When log.txt changes, charts are refreshed in real time (KST is an ultra-fast grapher and can display huge data files over hundreds of Mbytes). Beware : KST requires the default configuration file session.kst. Keep a backup of this file and restore it when needed. The ascii session file is language dependent : session.kst for French, session_EN.kst for English. For other languages (Spanish, German…), KST would display nothing because the session file syntax is incorrect so install the English version of KST. However, if you still wish a localized version, just modify parameter name “Colonne” in the configuration file session.kst : open session.kst with a text editor and translate all occurences of “Colonne” into your language and all should be fine. Create an new folder, eg “c:\program files\kst” (any folder name is fine) and extract the zip file content into that folder (download zip file 13Mb). Insert the dongle and install the driver (download driver files 0,22Mb). 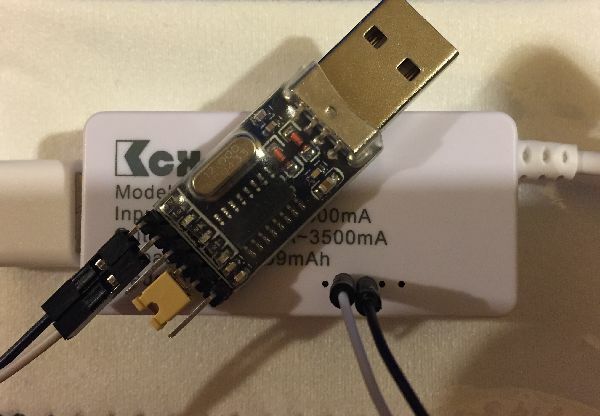 Charge Doctor connected to dongle. Don’t remove the yellow strap. Double-click on graph.bat, ( graph_EN.bat for English users) to run KST, that’s all. When log.txt changes, the charts are refreshed in real time. They must animate with new incoming data. If nothing after 30 seconds, quit KST and restart. Beware, log.txt must be in ascii text format, with separator ‘,’ and no space. Any spurious character (space, tab) will result in reading zeros by KST.exe. If any display problem, check log.txt first with a text editor. For more advanced use of KST like adding annotations, dynamic texts, drawings, lines… and even macro programming, see tutorial videos on the internet. Click “Add all” to move all fields from left to right. Change the number of samples and/or options “from start” or “to end”. All other options are let unchanged. Click “Apply” to update the X-scale change. Gotway 340Wh. In fact, I can’t charge more than 300Wh. Cheating from GW ? Generic X3 Clone 130Wh. In fact, I can’t charge more than 125Wh, not bad. New charging session of the GW14 340Wh, after discharge down to 54.9V (3.43 V/cell) by riding until led flashing then further discharge by connecting to an external resistive load (a hair dryer) down to 52.0V (3.25 V/cell). Can charge up to 353 Wh so the pack stated capacity 340 Wh is real, no cheating from Gotway. But the mainboard don’t let the discharge go beyond 300 Wh or >90% stated capacity to extend the battery life. Great product, and a good post too. I’ll have to do this with my Charge Doctor soon and test all my different wheels.